A healthy, vegan, gluten free, snack that takes five minutes and five ingredients? 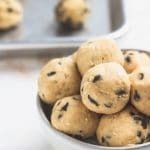 These peanut butter chocolate chip energy bites are just that. And they taste like cookie dough. Winner. Place all ingredients, except for chocolate chips in the bowl of a food processor. Process until smooth, stopping to scrape down the sides once or twice. Add chocolate chips and fold in with a spoon or spatula. Roll ping pong sized balls (about 1.5 tablespoons a piece). Serve, or chill in an airtight container. They’ll keep refrigerated for up to five days. Natural peanut butter is totally fine here, also almond butter. The chocolate chips keep things plenty sweet.